adidas Originals presents the Unite Joburg Exhibition in AREA3 has been a huge success since it first opened its doors on 3 December. 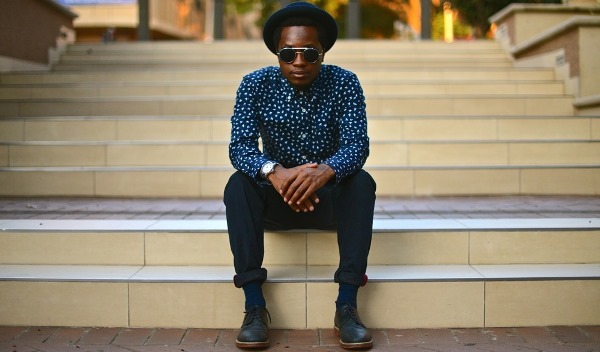 Five Joburg photographers were commissioned by adidas Originals to capture portraits of the people that unite Joburg. Renowned artist Anthony Bila was tasked with capturing his interpretation of Newtown. HYPE caught up with Anthony to discuss his journey from past and present to his future. HYPE: Where did your journey towards the arts really begin? Anthony: It began when I was encouraged to read a lot at the age of 5/6 by my parents. I came from a lesser privileged background. I didn’t get to see much of the world or travel or see South Africa except for the township I lived in which was Tembisa. Reading opened a whole world I didn’t know about. Through reading about people like Da Vinci, Michaelangelo and Picasso as well as artists and photographers from all around the world, never mind the architecture and cultural richness from Africa, it fostered the need to express myself. Once you reach a certain point of consuming a lot of information whether it’s art or music or writing, you reach a point when consuming is not enough. Once it wasn’t enough I wanted to give a voice to my own interpretation of the world around me. You want to share that and get people’s feedback so that’s where it really all began. What inspired your pieces for the adidas Originals Unite Joburg Exhibition? It was really an exciting thing. I had complete creative control. I was commissioned to Newtown. We were encouraged to put the word out on social media. They wanted us to get hold of our friends to have their portraits taken. But what I wanted was to capture the true essence as I interpreted Newtown so I didn’t let any of my friends know. Reason being I wanted that day to be a true reflection of the people that passed on that particular day. I hopefully achieve that. You’ve become a brand and gained a large following. When people reflect on your style, what are you hoping they take away with them? I hope people are inspired by the mediums I created and create their own stories and showcase that for themselves in whatever they do in their lives; In whatever pocket of the world they’re in. We highlight certain parts of South Africa as creatives, but there are a lot of other areas which are neglected. Those people in those areas should also be inspired to tell their own stories. There’s a few projects I’m working on for next year. The biggest one is my firsts solo exhibition. It’s called the Blkfrs. It’s redefining what Africanism is to Africans. A lot of people see us as the dark continent with brown people. Especially in South Africa we’ve become a big melting pot of different cultures and people of various descents. If you’re born on the soil of South Africa you’re South African. Whether mixed race or not, whenever you tell people you’re from here, you’re met with surprise and confusion. The series aims to interpret that we’re all Africans irrespective of colour. That’s the crux of the exhibition. It’s a multi-media exhibition. I’ve composed music for it, I’ve writtens some poetry, I shot a video and edited it myself. It’s an audio visual experience, not a one dimensional photographic expo. It’s a living breathing expo. It’s scary but exciting at the same time. The Unite Joburg Exhibition will be open at AREA3 every Thursday to Sunday from 12h00 to 16h00.